Ashley Hutchinson was lethal from outside the arc, netting five 3-pointers to highlight second-seeded Jefferson's 44-43 victory over Mahwah in a North Jersey Section 1, Group II quarterfinal on Thursday, March 3. Hutchinson, a junior guard, finished with 15 points. Julia Murawinski chipped in with 12 points for Jefferson (24-3). Taylor Langan followed with nine points. Mahwah's Sam Haubner led all scorers with 19 points. The Falcons will play host to No. 6 Westwood on Saturday, March 5 at 2 p.m. in the semifinal round. Senior guards Stella Johnson and Julia Rossetto scored 15 and 12 points, respectively, to spark the Crusaders in a Non-Public North B quarterfinal on Thursday, March 3. Johnson had a double-double, grabbing 12 rebounds. Rachel Mills, a freshman, scored seven points and took down seven rebounds for Morris Catholic, which used a 13-2 second quarter to gain a 24-11 advantage at halftime. Fourth-seeded Morris Catholic will meet top-seeded Saddle River Day in the semifinals on Sunday, March 6 at 3 p.m. at Rutgers University. In North Jersey Section 1, Group IV quarterfinal action, the Colonials, who received 13 points from Abby Schubiger, fell to Montclair on Thursday, March 3. The Mounties outscored Morristown 11-0 in the extra period. For Montclair, Alisa Wiggins had 15 points and Bianca Fede had 12. Kim Calloway was the Colonials' second-highest scorer with nine points. Abbey Lawrence and Mariah Perez had 17 points apiece to send Newark Tech past the Hornets in a North Jersey Section 2, Group II quarterfinal on Thursday, March 3. Perez dominated on the board, ending with 18 rebounds. Hanover Park's Ava Gammo, a junior, topped all scorers with 19 points. Alexa Bursese and Alexa Petrozzino, two other junior guards, added 10 points each for the Hornets (22-5). Hackensack, behind Alison Wickersheim's double-double (12 points, 13 rebounds), defeated the Rams in a North Jersey Section 1, Group IV quarterfinal on Thursday, March 3. Laura Lopez (11 points) and Caleigh Golabek (10) also attained double figures in scoring for Hackensack. Juliette LaMancuso paced the Rams with 13 points. LaMancuso had four 3-pointers. Katie Kerrigan had 15 points off five 3-pointers and Erin Fulmore had 10 points but the Vikings fell to Rutherford in a North Jersey Section 2, Group II quarterfinal on Thursday, March 3. Rutherford soared behind Jessica Rogers' 20 points and 12 rebounds. After three quarters, Rutherford held a one-point edge but outscored Parsippany Hills 21-14 in the closing period. Ilissa Webb's 13 points paced a well-balanced attack when West Morris defeated Nutley in a North Jersey Section 2, Group III quarterfinal on Wednesday, March 2. Maddie Selvaggi contributed 11 points, seven in the closing period, for the Wolfpack. West Morris advances to the sectional semifinals and will face Somerville on Friday, March 4. Parsippany Hills, fueled by Tori Lombardi's 23 points, powered to a 53-25 victory over West Side in North Jersey Section 2, Group II action on Tuesday, March 1. Lombardi had a hot hand from the outside, canning four 3-pointers for the Vikings, who will play fourth-seeded Rutherford in the second round on Thursday, March 3. The junior guard also made seven steals and had four rebounds and four assists. Three of Lombardi's baskets from outside the arc came in the third period when Parsippany Hills outscored West Side, 15-5, to pull ahead, 44-23. Steals were abundant in the first quarter for aggressive Parsippany Hills. "I thought we did an excellent job in the first quarter of running our stuff and turning them over," Vikings coach Donnie Forster said. "We tried to play faster in the second quarter when they pressed us." Senior forward Mikaela Dredden joined Lombardi in double figures with 11 points. Dredden also took down seven rebounds, blocked five shots and made five steals. Erin Fulmore made six steals. "We need Rochelle and Mikaela to do their thing if we're going to beat Rutherford," Forster said. "They're going to clamp down on Tori." Taylor Langan, a sophomore guard, recorded 16 points when the Falcons dispatched Newton in a North Jersey Section 1, Group II first-round game on Tuesday, March 1. 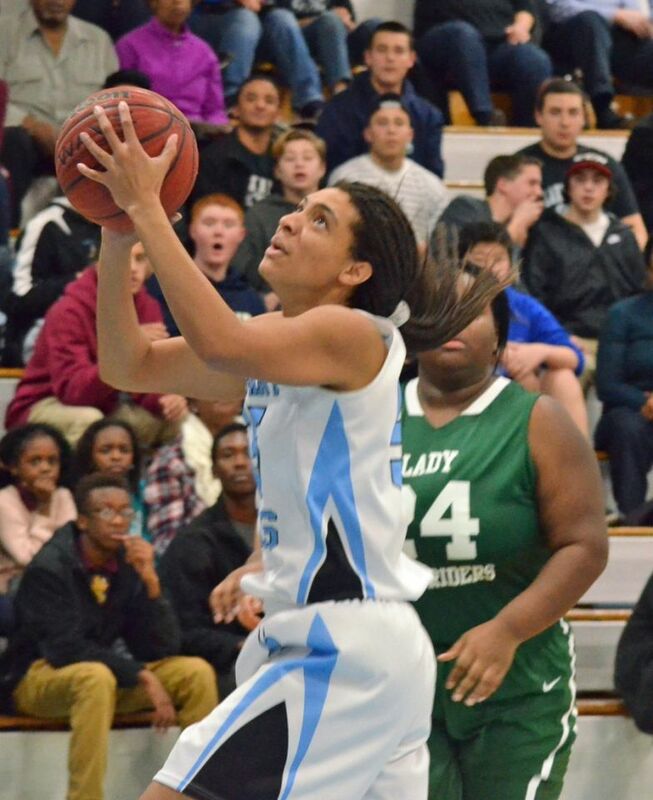 Ashley Hutchinson had 14 points, netting four 3-pointers, for Jefferson, which raised its record to 23-3. Newton received six points from Arianna Ziegler. Senior guard Rhiannon Groll thrived at crunch time, netting two free throws with .01 seconds remaining to lift 15th-seeded Boonton to a 65-64 victory over second-seeded Hasbrouck Heights in a North Jersey Section 1, Group I first-round game on Monday, Feb. 29. Groll, who also came up with four consecutive points when the Bombers were trailing by three, posted a career-high 28 points, handed out eight assists and had six rebounds. "Rhiannon was remarkable," Boonton coach Jim Drury said. "That was, by far, the greatest game she ever played in her life. She just took over the game when we needed it." Adriana Dika also was in double figures for the Bombers with 10 points. Boonton (8-19) came up big on the boards. Three players - Caitlin Mollahan (14), Chelsea Davis (12) and Devin Gibbs (10) - had double-digit rebounds. Mollahan had five blocks. Karina Meyer had three of Boonton's eight 3-pointers. The Bombers will clash with No. 7 Becton on Wednesday, March 2 at 7 p.m.
Samantha Flinn recorded a double-double (19 points, 10 rebounds) to propel 12th-seeded Butler in North Jersey Section 1, Group I action on Monday, Feb. 29. Megan Dranow joined Flinn in double figures with 11 points. Taylor Russnak contributed nine for the Bulldogs (10-14). Melissa Konopinski ended with eight points and seven rebounds for the Bulldogs, whose next opponent will be fourth-seeded Midland Park. Maddie Selvaggi scored 12 points and had nine assists to pace the No. 3 Wolfpack in their North Jersey Section 2, Group III opener on Monday, Feb. 29. Ilissa Webb and Katlyn Bridges chipped in with 10 points apiece. Webb had five rebounds and Bridges grabbed four rebounds and made four blocks. West Morris (22-5) moves into the quarterfinals and will have a home game against Nutley on Wednesday, March 2. Chatham earned a quarterfinal-round date with Mendham by defeating 13th-seeded Governor Livingston in a North Jersey Section 2, Group III first-round game on Monday, Feb. 29. With the fourth-seeded Cougars was trailing, 31-29, with 1:05 remaining, senior Cassie Falone drove the baseline and converted a reverse layup to tie the game before being fouled and and converting a free throw to put Chatham up 33-31 with 56 seconds to go. Veronica Kelly led the Cougars (18-8) with 10 points and Falone had seven. The Minutemen (16-10) received double-doubles from Ashley Gehrin and Courtney Bundschuh when they ousted Barringer in first-round North Jersey Section 2, Group III action on Monday, Feb. 29. Gehrin had 22 points and 10 rebounds while Bundschuh finished with 10 points and 10 rebounds.